We’d love your help. Let us know what’s wrong with this preview of Astrology, Karma & Transformation by Stephen Arroyo. To ask other readers questions about Astrology, Karma & Transformation, please sign up. in the very first chapter. He helps us understand karma in its various forms through its connection with several key astrological factors, namely Saturn, the "karmic" or crises-related signs Virgo, Pisces and Scorpio, the "water" houses, i.e. the fourth, eighth, and twelfth, and the Moon. being open to possibilities, and so on. jell with the rest of the book. astrological literature, a must read and a must have. Very in depth and valuable exploration of Uranus, Neptune, and Pluto in the context of the personal birth chart. Good introduction to Secondary Progressions. A lot of nice cross referencing of other astrologers and sources that are helpful for determining some further reading. A dense read at times that requires focus which is why it took a year and a highlighter for me to give it a thorough read but well worth it and I would def read more by this author who has a warm, positive style. So insightful and blissfully informative, Stephen Arroyo is a "friend in my head." His writing is thorough and satisfyingly explanatory. Arroyo's understanding of the complexities of human nature and profundity of astrological knowledge is most impressive. Anyone interested in astrology must read this knowledge-filled book. Just started reading this book ... and ... it is incredible. Explosive insights into the birth chart based on its karmic/transformative points. Seriously good stuff for the practitioner/counselor and laymen. Should be required reading for all humans. This is one of the best books I've read on Astrology. All his books are well written and insightful. One of the best books on astrology ever written. Deep meanings of planets in natal astrology and how to think about transits and other dynamic factors in astrology from a process oriented point of view. A must read* one of the most precious astrology books I've read so far. my favorite book on astrology yet . THE best book ever on the outer planets in all regards: The basic themes they represent in the birth chart, in aspect to inner planets, transits, progressions. He even has a chapter on fire houses and signs and for someone with both of these prominent in my chart (and a grand trine in both with Sun, Moon and Pluto), I understood why I had a such deep pull toward astrology, transformation the deeper spiritual meaning of life. Arroyo is a master, clearly and throughly presenting his understanding of saturn in all the different aspects. Still, in my opinion, the book is not necessarily user friendly. Searching for information between case studies, I found sometimes slightly less than irritating. I appreciate the information but I would have appreciated less case study and more straight info. On the other hand, this is the second time I have read the book, so it was compelling enough to have me re-read it. This was just my second Astrology book and omg it was amazing! It took my understanding of Astrology to a whole new level and helped to see the bigger picture of it. I don't know what else to say because it was everything I hoped I'd get from reading it and more. I need to pick up some of his other books too. Love this book. The author is sophisticated in his description of the psychological, spiritual, and energetic complexities of Saturn and the planets beyond. Highly recommend - not the typical astrological categorical trite stuff. VERY informative. Deep and more spiritual than your average astrology book. i think this book just for professional astrologist because it has in-depth talking about aspects and it explains a lot of different things with those and it does not have individual chart information. Brilliant book! I happened to read it exactly when I needed to.. gave me a new perspective on the meaning of the outer 5 planets and the need for and importance of personal transformation.. definitely recommended for all those studying astrology..
Full of astrological/psychological insight. Though I reject the reincarnation dogma (and this book is obviously full of it) it's still a good reference tool for any serious student of astrology. This book has a different take on asstrology than most, it is not so much concerned with prediction, but with the soul's longing for spiritual growth and transformation. A very good read. Moje první kniha od Arroya, která mi otevřela mysl i duši. Astrologie dostává v autorově pojetí nový rozměr, je odprostěna od zastaralých koncepcí a stereotypních vzorců a zasazena jak do běžného života, tak do zákonitostí vesmíru. Za mě jedna z nejlepších astrologických knih, které se mi dostaly do rukou. wow. way over my head, but definitely insightful and thought-provoking. arroyo doesn't provide easily digestible examples, but instead discusses the principles and patterns behind the planetary aspects of Saturn, Uranus, Neptune, and Pluto (apparently the planets associated with karma? i'm obviously a beginner). i'll have to go back to it in a few years. This is one of those books where I found myself nodding on almost every page because he was talking about me, or someone close to me. It goes deep into the outer planets and their transits. 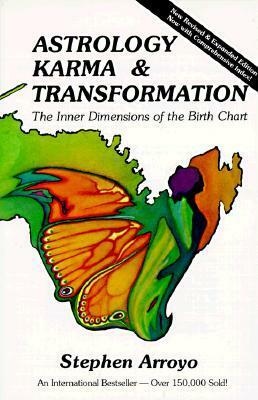 One gains a much better understanding of karma, too, from this book. This book is impossibly dense and therefore it's content is highly unapproachable. Arroyo seems to think that long, tortured sentences using the passive voice convey intelligent content. Nope! One of the first astrology books I read -- a modern classic in psychological astrology. Another great book for getting into the "deeper" aspects of astrology. There is a lot to take in, so it might not be for those who have only a casual interest in astrology. Very strong on spiritual themes, but not a reference. Stephen Arroyo (born October 6, 1946 in Kansas City, Missouri) is an American author and astrologer.